Ages 4 through 8. Here is an inexpensive game activity kit that comes with a full-color playing board. Students are challenged to give synonyms, antonyms, and to categorize words in a variety of ways. The activities stimulate thinking and problem solving. 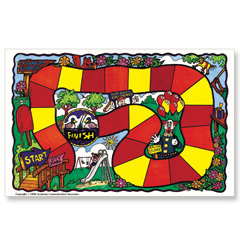 The game includes an 11"x 17"full-color playing board, spinner, and reproducible game activity cards.